The recycling of aluminum materials is an important green initiative since it can avoid the need for primary metals and Al–Si–Fe is a typical scrap aluminum alloy. 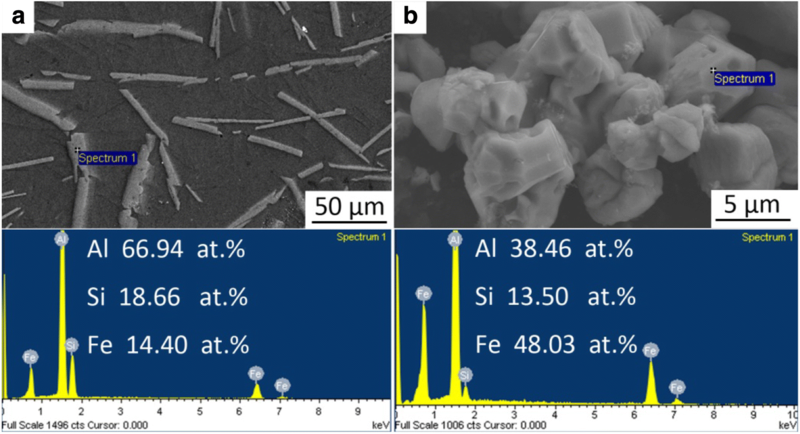 One key goal in recycling of Al–Si–Fe alloys is to reduce the Fe content via some techniques to separate Al and Fe. A proposed method to obtain this goal via introducing the Al–Si–Fe alloy into a Mg melt has been investigated in this work. A separation layer with gathered Fe-rich and Al-poor Fe3Al0.7Si0.3 particles was obtained at the bottom of the cooled ingot, indicating that β-Al5FeSi phase evolves into Fe3Al0.7Si0.3, and quantities of Al are released to the upper Mg matrix simultaneously. However, the evolution of Al3Fe by adding binary Al–Fe alloy into Mg melt is different. It is proposed that the element Si plays an important role in the phase evolution procedure, thus affecting the performance of this method. 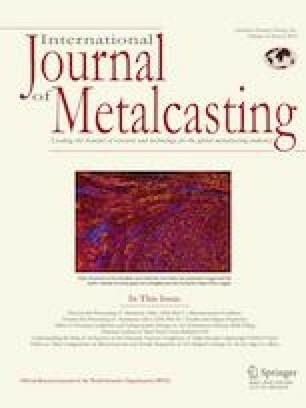 Based on our previous work,18,19 a method of using Mg melt to deal with Al–12Si–4Fe alloy has been studied in this paper. Due to the evolution preference of the Fe-rich phase and the density variation between it and the Mg melt, the separation of Al and Fe can be achieved. The performance of this method dealing with Al–4Fe alloy was also investigated for comparison. The materials used in this study include commercial purity Mg (99.8 wt%), commercial purity Al (99.8 wt%), commercial purity crystalline Si (99.9 wt%) and commercial purity Fe (99.9 wt%). Ternary Al–12Si–4Fe and binary Al–4Fe alloys were firstly prepared in a high-frequency induction furnace. To check the separation performance of Al and Fe elements by this method, the experiments were carried out as follows: First, Mg ingot was melted under the protection of 1% RJ-2 flux (40–50 wt% MgCl2, 35–45 wt% KCl, 5–8 wt% BaCl2, 5–8 wt% CaF2, 5–8 wt% NaCl and CaCl2) in a BN ceramic crucible as shown in Figure 1a, by using a resistance furnace to 780 °C. Then, Al–12Si–4Fe or Al–4Fe alloy was added into the melt with the proportion of 10 wt%. After the alloy totally melted, the melt was held for 30 min and air cooled to room temperature. Mg–Al alloy can be obtained in the upper part of the ingot, while a deposition layer can be obtained at the bottom of the crucible, as shown in Figure 1b, c. The chemical compositions of the upper part and bottom part were detected by an Inductively Coupled Plasma-Atomic Emission Spectrometer PE8000 machine, and the results are shown in Table 1. Schematic diagram for recycling of Al–Si–Fe alloys: (a) introducing Al–Si–Fe into Mg melt. (b) After melt holding and cooling, a separation layer rich of Fe can be formed. (c) The image shows the separation layer. Metallographic specimens were mechanically ground and polished by using MgO turbid liquid as in standard routines. The microstructure observations were carried out by a field emission scanning electron microscope (FESEM, Hitachi SU-70) operated at 15 kV and linked with an energy-dispersive X-ray spectrometry (EDX) attachment. The phase identification of the samples was detected by X-ray diffraction (XRD) with a D/max-RB diffractometer (Rigaku, Tokyo, Japan) using CuKα radiation at 40 kV and 100 mA. Figure 2a shows the microstructure of the Al–12Si–4Fe alloy. The primary Fe-rich intermetallics are flake-like in appearance, which is the common morphology in such alloys. After the alloy was introduced into Mg melt and applied the above-mentioned melting and cooling procedure, a separation layer was formed in the cooled Mg ingot, whose microstructure is displayed in Figure 2b. It can be found that amounts of Fe-rich particles are densely packed, while the size, distribution and morphology of the Fe-rich particles in the separation layer are shown in Figure 2c. The particles exhibit block-like with average size of about 5 μm, totally different from the flake-like particles (Figure 2a). 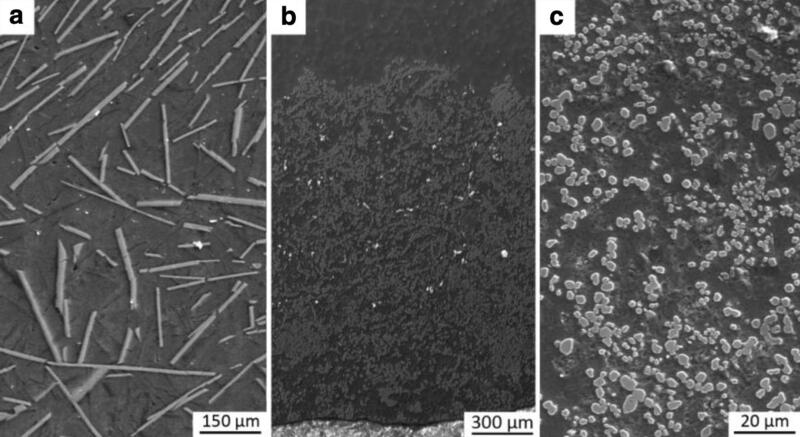 Microstructure of the Al–12Si–4Fe alloy (a), the formed separation layer in the cooled Mg ingot (b) and the blocky Fe-rich particles (c). Corresponding EDX results of the Fe-rich intermetallics in Al–12Si–4Fe alloy and in the separation layer of the cooled ingot are shown in Figure 3a and b, respectively. From the detected spectrum and element contents, it can be found that the original flake-like Fe-rich phase is β-Al5FeSi. This phase is quite rich in Al, indicating that a large proportion of Al has been fettered by it and therefore cannot be efficiently recycled by using traditional methods as mentioned earlier. However, after treating by the method displayed in Figure 1, the obtained block-like Fe-rich particles have a much lower content of Al (Figure 3b). The ratio between Al and Fe has evolved from 4.65:1 (Figure 3a) to 0.80:1 (Figure 3b). This indicates that quantities of Al have been released to the above Mg melt and thus can be recycled through this method. Besides, the reported data in Table 1 also confirms that this method is efficient since the Al content in the upper part of the cooled ingot is much higher than that in the bottom, while the Fe content exhibits opposite performance. EDX results of the Fe-rich intermetallics in Al–12Si–4Fe alloy (a) and in the separation layer (b). 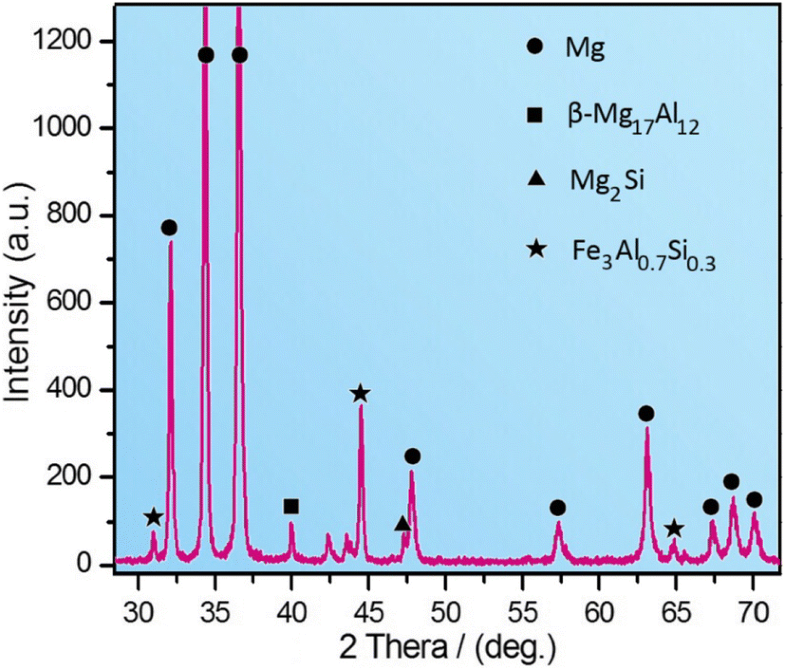 Figure 4 shows the XRD pattern of the separation layer, in which the main Fe-rich phase is detected to be Fe3Al0.7Si0.3 (Cubic, Fm–3m), i.e., phase evolution has occurred from β-Al5FeSi to Fe3Al0.7Si0.3 in Mg melt. As already discussed earlier, this phase is quite beneficial for Al recycling. XRD pattern of the separation layer. In order to acquire the detailed evolution procedure of β-Al5FeSi phase in Mg melt, the intermediate stage was obtained and the microstructure is shown in Figure 5a. It was found that after introducing into Mg melt, the particles evolve to polyporous, while they still keep the outline of original flake-like shape. EDX result (Figure 5b) indicates that the polyporous particles are the above-mentioned Fe3Al0.7Si0.3 phase. With a longer holding process, the polyporous particles break into small blocky ones (Figure 5c). Therefore, a schematic diagram can be drawn based on the experimental results. As shown in Figure 5d–f, after the Al–12Si–4Fe alloy was added into Mg melt, phase structure evolution (β-Al5FeSi → Fe3Al0.7Si0.3) and morphology evolution (flake-like → coralline → blocky) occur simultaneously. Microstructure and EDX of Fe3Al0.7Si0.3 phase in the intermediate stage (a, b) and the final stage (c). Schematic diagram of the evolution procedure of β-Al5FeSi in Mg melt (d–f). To analyze what happened to β-Al5FeSi phase in Mg melt, another experiment was conducted, i.e., Si–free binary Al–4Fe alloy was used for comparison. The microstructure of Al–4Fe alloy is shown in Figure 6a. Similar to β-Al5FeSi, the Fe-rich particles, i.e., Al3Fe, also exhibit flake-like appearance. After introducing into Mg melt with the same melting and cooling parameters, a separation layer has also been obtained as shown in Figure 6b. It was found that the Fe-rich phase has also evolved into a block-like appearance. However, based on the EDS result (Figure 6c), the particles can still be expressed by the formula Al3Fe. 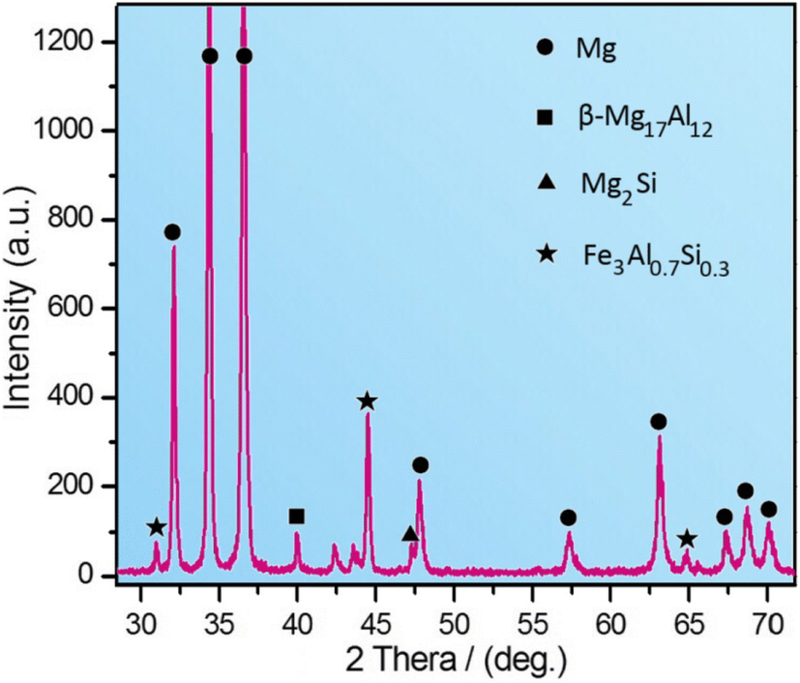 Therefore, it means that different from the evolution behavior of β-Al5FeSi phase in Mg melt, only morphology evolution but no phase structure evolution was detected for Si-free Al3Fe. The chemical compositions of this cooled ingot were also detected, as shown in Table 1. The bottom part is also rich in Fe, since the Al3Fe particles have larger density than Mg melt and prefer to sink. However, the concentration of Al in the bottom part is even higher than that in the upper part, which is quite different from the behavior of Al–12Si–4Fe recycling. (a) Microstructure of binary Al–4Fe alloy. (b, c) Microstructure and EDX of the Fe-rich particles in the separation layer obtained using this method. It is quite confusing as to why Al3Fe does not evolve to another phase in Mg melt, just as the performance of β-Al5FeSi. To clarify this question, an AIMD calculation on the Mg–Al–Fe system was then conducted. Due to the limitation on calculation amounts, a total number of 200 atoms were used. However, based on the experiment system (Mg + 10 wt% Al–4Fe), the actual Fe atom number is calculated to be less than 1. This will result in quite large statistical error of the structure functions. Therefore, the system was then designed as Mg177Al18Fe5. The obtained partial pair correlation functions at 1173 K are shown in Figure 7. It is clearly observed that the first peak of partial pair correlation function gAl–Fe(r) curve is much higher than the other curves, indicating that the affinity of Al–Fe pairs is strongest. For the gFe–Fe(r) curve, the second peak is more obvious than the first one, indicating that Fe atoms prefer to avoid meeting each other directly. Therefore, it means that it is not easy to make Fe-rich clusters evolve to a more Fe-richer one in the Mg–Al–Fe system. Also, the Fe atoms bind the Al atoms strongly in the melt, even surrounded by amounts of Mg atoms. As a result, Mg melt fails to prompt Al3Fe phase evolving into an Al-poor phase. 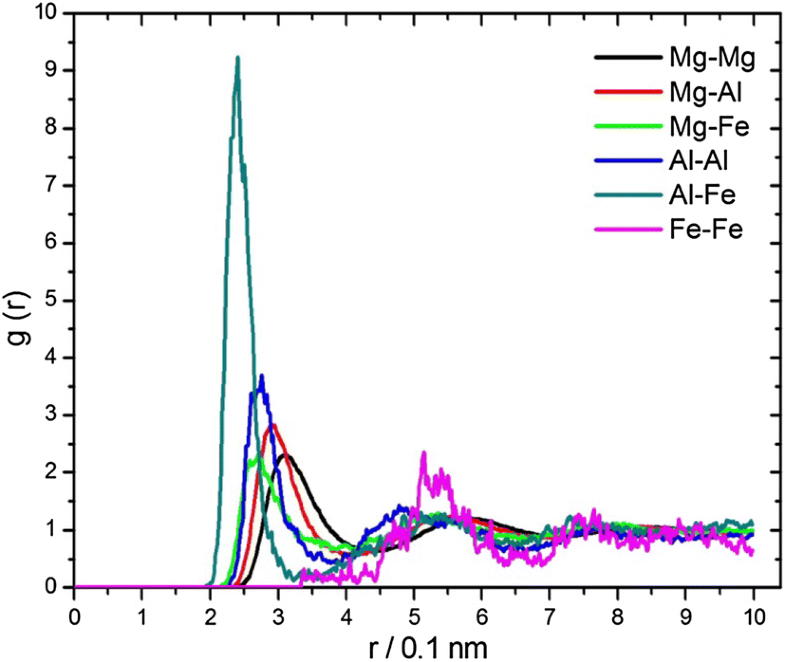 The partial pair correlation functions of Mg177Al18Fe5 system at 1173 K.
Based on the different behaviors of β-Al5FeSi and Al3Fe in Mg melt, it is reasonable to suppose that Si plays an important role in the phase evolution during recycling of Al–Si–Fe alloys. It is believed that the detailed mechanism still needs further study. Besides, since the industrial scrap Al–Si–Fe alloys may have complex composition, the influence of other impurities on the performance of this method remains doubtful. Continued efforts should be made for promoting this method in industries. The separation performance on Al and Fe by introducing 10 wt% of Al–6Si–4Fe alloy into Mg melt has been discussed in this work. Along with the evolution from flake-like β-Al5FeSi to block-like Fe3Al0.7Si0.3, a separation layer rich of Fe-rich particles was obtained at the bottom of the melt. Through this procedure, Al can be released to the upper melt and thus can be gathered and recycled. 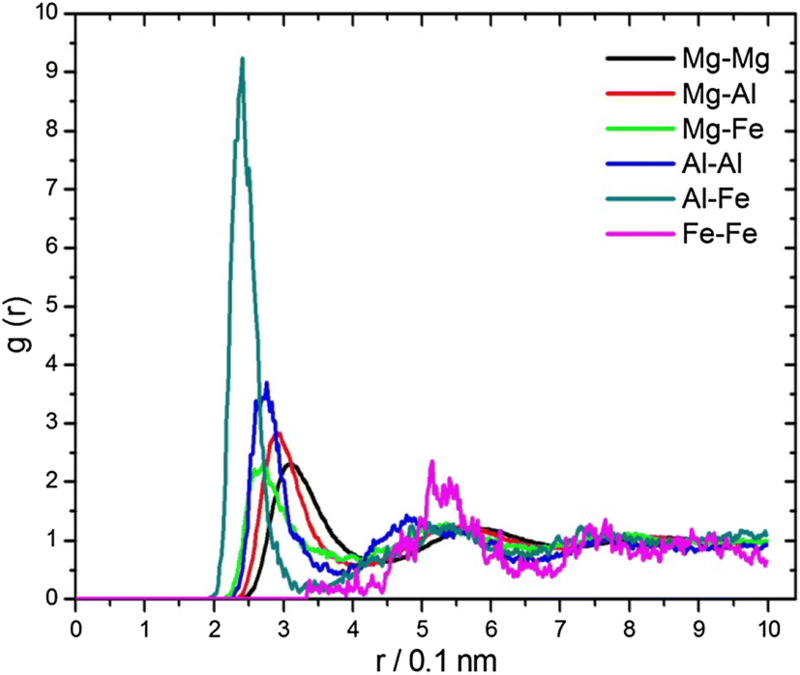 Compared with β-Al5FeSi, the evolution of Al3Fe in Mg melt is different. Only morphological evolution, not phase structure evolution was detected. It is regarded that Si plays a significant role in the evolution procedure. This research was financially supported by the National Natural Science Foundation of China (No. 51601106) and the China Postdoctoral Science Foundation (No. 2017T100489).